a segway through golden gate park? The Segway — a two-wheeled, self-balancing electric vehicle — has been appearing with increasing frequency in Golden Gate Park lately. I assume that the inventor of this device came up with the name by way of the word segue, which means: to move smoothly and unhesitatingly from one state, condition, situation, or element to another. If you’ve ever tried to master the art of moving by means of a Segway, you will understand how aptly the device is named. It functions like a sophisticated gyroscope which you control by leaning your body weight in the direction you want to go. Smooth and unhesitating movement is essential! And to segway properly requires a sort of zen-like mindfulness which, once mastered, is transporting. We are seeing more of these devices in Golden Gate Park because, according to SF Gate: “the Recreation and Park Department approved a five-year concession agreement with Electric Tour Co. to run Segway tours in the park, which began last month. The department, which has been on the hunt for more revenue to stave off service cuts, expects to receive about $100,000 a year from the contract, said Nicholas Kinsey, the department’s assistant director of property management. As the officially sanctioned tour operator, Electric Tour Co. gets use of the lot behind the band shell for staging and storage, and permission to use the pedestrian paths, Kinsey said. Meanwhile, he said the department is seeing what, if anything, can be done to regulate Segway users in Golden Gate Park not affiliated with the official concessionaire. The company operates two tours a day, each with no more than nine participants, including the tour guide. The tours cost $70 per person and last about two hours. Before they set out, participants undergo training on safety rules and how to operate the vehicles. One lesson: Pedestrians always have the right of way, said tour company president Brian Huber. Less than 20 percent of the tour traverses pedestrian-only paths, such as those that go through the Rhododendron Dell and the redwood grove, Huber said. 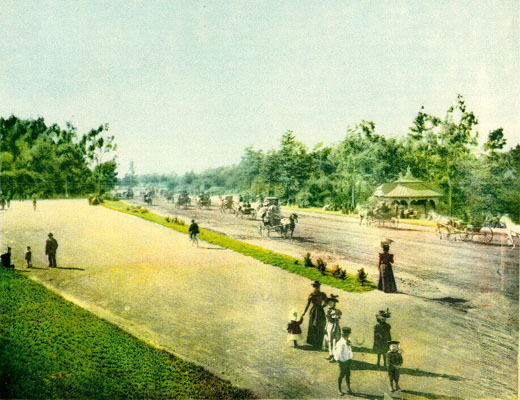 Some of the more sensitive areas, among them Strawberry Hill in the middle of Stow Lake and a path in the historic Music Concourse, were removed from the original route, Kinsey said. I had the pleasure of trying a Segway last summer in the Great Park in Orange County. I loved it! Seems to me a great way to tour a large park and a clever way to raise some funds to help maintain the park. However, not everyone agrees. To read some of the objections to Segway tours in the park, follow the link at the bottom of this post. But I suggest trying a Segway ride yourself before you make up your mind. 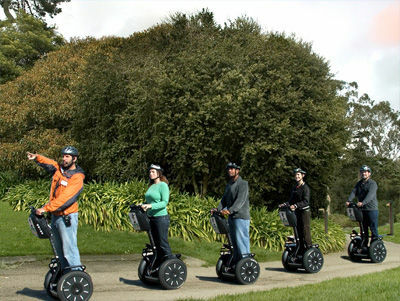 via Segway tours irritate some in San Francisco. This entry was posted in recreation and tagged golden gate park. Bookmark the permalink. 1 Response to a segway through golden gate park?